A multi-author series, coming soon, from a dozen of your favorite New York Times, USA Today, and Amazon bestselling Paranormal Romance authors. 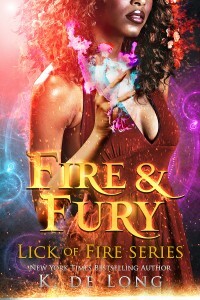 Lick of Fire will include Katie’s Phoenix Burned serial, set in the Inkubus universe. For more information on Lick of Fire, visit LickofFire.com. He took everything from her: her family, her homeland, and her future. She’d give anything to forget him. The last time Abeni saw her ex-lover Eren Tristram was when he abandoned her, financing his own future with her family’s heirlooms. She hardened her heart, and promised no one would ever get back in. 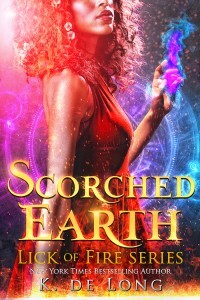 After years of struggle and exile, the phoenix shifter found herself onstage, dying and rebirthing herself for a crowd of the demonic elite–regardless of the sacrilege and judgment. But when hired to perform at a rural Midwinter Festival, the last thing Abeni expects is to see Eren again–awaiting his execution at the festival’s end. Her disappearance has haunted him for centuries. And now she’s his only hope. Eren’s only chance of survival is to make amends to the woman he wronged, when he was barely more than a pup, caught between family and love. But Abeni has had hundreds of years to hold this grudge and build her walls. She’s found success despite the pain he brought her–why should she risk that all for the ghost of the love he took advantage of once before? 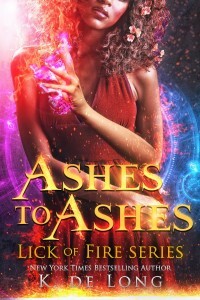 Phoenix Burned is a serial–don’t look for a happy ending until the very end. Cliffhangers included. It contains mature content that may be upsetting to some readers, including depictions of mental illness, suicidal ideation and self-harm, and graphic violence. Katie would like to caution readers to take extra care in reading if they are sensitive to presentations of this subject matter. Available on Amazon, B&N, iTunes, Kobo. Now available on Amazon, B&N, iTunes, Kobo.